KATOWICE, Poland — The United States worked with Russia and Saudi Arabia on Saturday night to sideline climate science in U.N. negotiations, angering nations that say urgent action is needed for their survival. The three countries and Kuwait blocked nearly 200 nations involved in the U.N. Framework Convention on Climate Change from "welcoming" a U.N. report in October saying that "unprecedented" action is required to keep warming to 1.5 degrees Celsius and stave off worldwide hardship. Vulnerable island nations and other developing countries tried to elevate the 1.5 C goals with the type of diplomatic subtlety these talks are known for. But welcoming the report was too strong a message for the United States and other nations that oppose climate action. Instead, the United States and its partners demanded that the body simply take "note" of the landmark finding by the Intergovernmental Panel on Climate Change that global greenhouse gas emissions must plateau within 12 years to avoid the worst effects of rising temperatures. Their language wasn't agreed to, either, and the meeting has yet to decide how or whether it will acknowledge the report. The State Department said its position shouldn't have been a surprise. "The United States was willing to note the report and express appreciation to the scientists who developed it, but not to welcome it, as that would denote endorsement of the report," explained a State Department spokesman. "As we have made clear in the IPCC and other bodies, the United States has not endorsed the findings of the report." The United States and Saudi Arabia dropped objections to the report's summary for policymakers in October at a U.N. meeting in South Korea, allowing it to move forward. But Saudi Arabia held out to the end, searching for ways to scuttle the findings of the world's top scientists that countries must substantially curtail their fossil fuel use in the next 12 years to avoid catastrophic sea-level rise and other damaging effects. The Saudis lifted their hold on the document when faced with being singled out as the only country trying to block it. And the State Department specified at the time that its acceptance did not amount to an endorsement of the underlying science, which was drawn from thousands of reports by top authorities in the field. "The contents of the authored chapters have not been subject to line-by-line discussion and agreement, and remain the responsibility of the authors," the State Department said in October. In a statement to reporters on Monday, Saudi Arabia doubled down on arguments its representative to the IPCC made repeatedly at the South Korea meeting about the supposed inadequacy of the scientific literature on issues like the costs and benefits of climate mitigation and the price of holding warming to 1.5 C.
The Saudi statement expressed hope that a future IPCC report would fill in these "gaps," and "that a consensus to welcome it among all parties can be reached." "This is the Saudis' traditional behavior,”" said Alden Meyer, strategic and policy director for the Union of Concerned Scientists, at the talks in Katowice. "They try to block, water down, delay, and then, when they fail at that because they're overwritten by other countries, they fall back on uncertainty. To them, scientific certainty is anathema because it would impact their oil sales." Meyer said that in closed-door meetings among negotiators, the Saudis had referred to the scientific report as a "political" document. The Saudis did not immediately respond to comment. The Saturday night standoff drew the ire of some climate scientists, like Michael Mann, who tweeted: "There IS an axis of evil in the world. It is the fossil-fueled triumvirate of Trump, Putin, and Saudi Arabia who have colluded to sell out the future of this planet for their own short-term financial gain." The U.S.-Saudi alliance, which has existed all year, frustrated negotiators from developing countries and their advocates yesterday. Those nations fought at the Paris conference three years ago to commission the U.N. report to support their plea that the world take drastic steps to protect them. "Don't forget, it was our persistence that got the 1.5 report," said Ronny Jumeau, a negotiator for Seychelles in Paris. The Paris climate agreement called for countries to keep emissions "well below 2 degrees" Celsius and made 1.5 C an aspirational goal. Islands and poor nations protested at the time that it wasn't strong enough and could leave them exposed to disaster. But now that the science has spoken, Jumeau said, it isn't having the "oh, my God" effect that vulnerable countries were banking on. "People are negotiating as if the 1.5 report never came out," he said. The report showed that man-made warming might be grimmer than previously thought. "People were concerned that the IPCC, because of the way it works, would pull some punches, and it didn't," Jumeau said. "We would have thought that that would translate into the negotiating rooms, but it doesn't seem so." Saleem Huq, director of the Bangladesh-based International Centre for Climate Change and Development, called it "amazing." "The IPCC special report was accepted by all of the countries here, and now they're in the UNFCCC and they don't want to acknowledge it," he said. A significant portion of Bangladesh's territory could be compromised by sea-level rise by 2030. 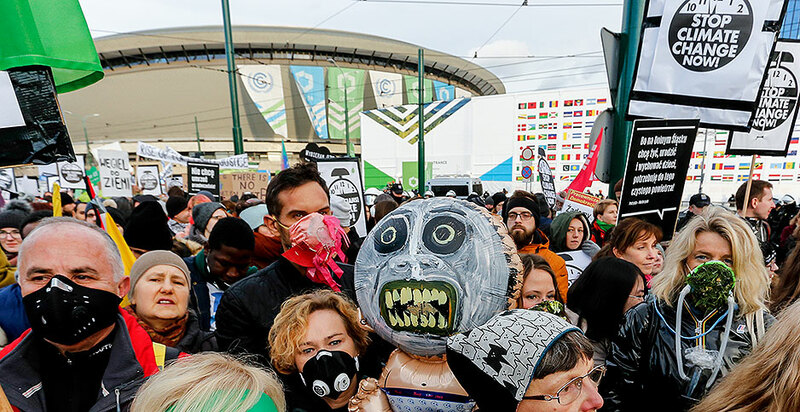 Experts here say poor countries and their allies won't rest until the 1.5 C report gets the recognition it deserves, and predicted the issue would resurface later this week when it comes time to negotiate the meeting's final decision. Nor is it only developing countries that see it as important. Elina Bardram, head of international relations for the European Commission, said the Conference of the Parties (COP) must not only acknowledge the report but also grapple with how to ensure Paris implementation responds to it. "The E.U. is very much a proponent of science- and evidence-based policymaking," she told reporters Saturday. "We think that politicians must have the courage to not just take note but to acknowledge the result that comes from an intergovernmental process." While there are "sensitivities" around the 1.5 C report, said Bardram, "the COP has to recognize what has come out, and it has to be able to trigger a process as foreseen in the relevant decisions of Paris of genuine global reflection about the adequacy of ambition as a result." Participants in the talks here in Katowice, a coal town that last week had the second-worst air quality of any city in Europe, are feeling the effects of global political events, as well. "Yellow vest" protests in France exploded for a fourth weekend Saturday, resulting in more than 1,000 detentions and numerous hospitalizations. The riots were sparked three weeks ago by French President Emmanuel Macron's plan to increase already-high fuel taxes, but the government put those on hold last week in response to the public outcry. The renewal of demonstrations this weekend seems to show what most experts have said, that the leaderless movement is responding to a broad program of changes to France's social safety net and tax laws and not just the fuel tax. But President Trump doubled down Saturday on his view that the riots reveal an erosion of French support for climate action, and in particular the Paris deal the country helped to deliver. "People do not want to pay large sums of money, much to third world countries (that are questionably run), in order to maybe protect the environment," he said on Twitter, adding that the mostly left-leaning "yellow vests" had taken to chanting "We want Trump!" Leading French newspaper Le Monde reported Saturday that no journalists covering the protests in Paris and other cities had heard that chant. It's possible Trump was responding to a viral video — recorded in the United Kingdom — showing a man dancing on a truck in a Trump mask. Catherine Abreu, director of Climate Action Network Canada, said it wasn't surprising that Trump would try to capitalize on the riots. "I think that that's really a very manipulative take on the situation that those who are interested in perpetuating the status quo are trying to promulgate, and in reality, I think what we're witnessing is the bubbling over of a combination of a lot of stresses that everyday working people around the world are experiencing," she said, naming automation in manufacturing and the breakdown of the social safety net as examples. "I think all of those things are contributing to a brew that can pretty quickly bubble over." The takeaway for the climate talks is not to abandon the Paris Agreement, she said, but to make sure that social welfare is built into its rulebook. Despite Trump's tweets and his plans to abandon the Paris Agreement in 2020, the United States sent about 40 officials to these talks, including a handful of political staff members. White House energy adviser Wells Griffith will host a roundtable today with U.S. fossil fuel executives, a reprise of a similar event last year that sparked protest from climate advocates. Dan Lashof, director of the World Resources Institute, called the plan "ludicrous." "This sideshow in Poland would be laughable if the consequences of climate change weren't so deadly serious," he said. Saturday's battle over "welcoming" and taking "note" shows that the United States and Saudi Arabia are standing together at multilateral forums to object to climate action. The two countries and Russia were among 20 major developed and developing countries at the Group of 20 meeting in Argentina earlier this month. Only the United States declined to endorse the Paris Agreement in that meeting. A senior administration official told reporters after the G-20 meeting that countries like Saudi Arabia, Russia and Turkey are wavering on the Paris Agreement, indicating that they might be moving away from the deal. There's little evidence that those countries are eyeing the exits, but some participants here wouldn't be sorry to see them go. "If they want to leave, they should leave," said Huq, including the United States in that statement. "Having them in and disrupting the process is worse than having them out. "They should not even come to the meetings," he said. But the United States is still in the global climate pact, as American progressives attending this month's talks are eager to remind participants. And the State Department team led by Office of Global Change Director Trigg Talley and diplomat Judith Garber are fighting for a slate of long-held U.S. objectives, especially near-universal requirements on transparency of commitments and progress related to the Paris Agreement. Negotiators here spent last week whittling down the text from about 300 pages to just over 100. The objective is to write a set of implementation guidelines for the Paris Agreement commonly called the "rulebook." Some negotiators say they're discouraged by the slow progress at what is billed as the most important COP since Paris, but other participants say agreement on some seemingly intractable problems may be closer than it appears. "You can't judge a book by its brackets," said Sue Biniaz, a longtime State Department negotiator. Vulnerable countries, meanwhile, want to find a home for "loss and damage" — financial support that would account for irreversible losses from warming — in as many aspects of the rulebook as possible. If emissions keep rising and life in their homelands becomes untenable, they say, they're going to need the world's support.